Continuing its commitment to nurture learning, support economic advancement and strengthen communities, Chicago Public Library’s YOUmedia partners with Donda’s House and Commonwealth Foundation to present the (PRO)jectUS Summer Session offering positive alternatives for Chicago’s youth. (PRO)jectUS is a mentorship program for young people age 14-23, in the areas of fashion, music and media. As a bonus, the (PRO)jectUS team have scheduled a week-long open house entitled STEAM Studio, at the Chicago Cultural Center, 78 E. Washington St., from July 20 to July 24, 2015. STEAM Studio is a production-focused maker fair especially designed for teens and young adults, but open to all visitors age 14 and older. During the week, teen and young adult visitors can attend the open house from 1pm-4pm, and participate in hands-on and interactive workshops with professionals in the fashion, media and music industries, as well as learn about other Chicago youth programs. The week culminates on Friday with a Trunk Show, where (PRO)jectUS participants will showcase their fashion designs, music and new media creations to the public. 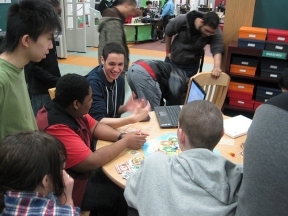 (PRO)jectUS is supported by the Hive Chicago Fund for Connected Learning through the Chicago Community Trust and Chicago Public Library Foundation. © 2849 Chicago Hispanic Newspaper, Lawndale News, Hispanic Bilingual Newspapers, Su Noticiero Bilingue. All rights reserved. XHTML / CSS Valid.